Stunning Ladies Silver Eternity Ring with - Size P Benefits Cancer Research UK Comes with either leatherette or velvet quality display box - Would make a wonderful gift or addition to your jewellery box Dispatched same day if payment clears before the post run at 14:30 with Royal Mail 1st Class This is beautiful brand new jewellery acquired from job-lots and wholesale lots so I can’t 100% guarantee metal ect. Grab yourself a bargain and help a good cause Thanks for reading.... Happy bidding!!! The main stone has an Agate marble effect and has a facet cut on top although w e do not know what the main stone is. 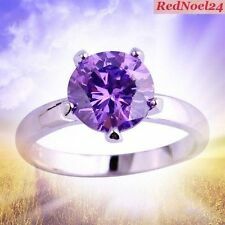 Silver and gold plated purple pear shaped stone ring size N total weight 6.21 Grams. 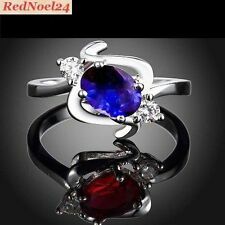 ~ DIAMONIQUE 0.3ct tw LEAF BAND RING with Rose-Gold Plated Accent Sterling Silver - SIZE P 1/2 - Q. This beautiful ‘Diamonique’ band ring has an intricate LEAF design, crafted in sterling silver with gold-plating accents and embellished with round-cut simulated white diamonds. Topaz Ring, bought in Australia, 3 Stones, silver band. Condition is Used. Dispatched with Royal Mail 1st Class. Chic Pretty Round Yellow Citrine and Cubic Zirconia 925 Silver Plated Ring Size 9 - R. 1 Main Citrine Precious Stone Carats: 1.75 carats - 9 mm x 9 mm. Gem type: Natural Citrine and White Cubic Zirconia. 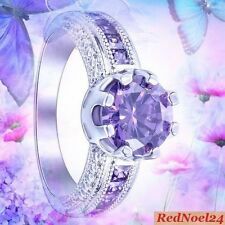 Unusual Capturing 4 Band Czech Crystal 925 Silver Plated Ring Size 7.5 - O . Gem type: Czech Crystal. 33 Tiny Round White Czech Crystal Gemstones: 0.04 carat each - 1.5 mm x 1.5 mm. Main Czech Crystal Carat: 0.75 carats each - 4 mm x 4 mm.